My daughter has attended the Mesa Child Development Center (MCDC) since Summer 2011; she'll be leaving for kindergarten in the Fall. She told me that she doesn't want to go to kindergarten, because she'll miss Mr. Matty (Matthew Proctor), her teacher at MCDC. She said that although she'll turn 5 on her upcoming birthday, she wants to turn back to 4 on the next one! Matty has a similar effect on most of the children and parents at MCDC. When I arrived to pick up my daughter one day, I found her outside with 2 other children and Matty, all lying on the ground drawing pictures of a grasshopper they'd found and were watching. This illustrates his style: observing nature, spontaneously turning it into a group art project, and teaching biology/ecology/conservation at the same time. The children also really enjoy the long term group construction projects they undertake under his guidance. Last year they decided to use some recycled wood to build a racetrack. Over the course of many weeks they designed it, learned how to use woodworking tools to construct it, modified their design several times, and decorated it. They were so (justifiably) proud of it, that for the next several weeks every time I was there some of them would show it to me. The children also love Matty's guitar playing and singing my daughter was thrilled when she asked him if he knew any Beatles songs and he played "Blackbird" for them. His singing seems particularly valuable for the substantial number of children who don't speak English at home it welcomes and includes everyone, celebrates diversity, and is an easy, fun way to start learning English. Watching Matty over the last year and a half led me to think for the first time that I would enjoy teaching preschool! Matty was the Lead Teacher when MCDC opened in March 2009. He created the curriculum from the ground up using the Reggio Emilia approach, and has been refining it over the last 4 years in collaboration with his supervisors and co-teachers, as well as with input from the students and parents, exemplifying UCSD's Principles of Community. Most recently he has helped implement individual student assessment using the new California Dept. of Education Desired Results Development Profile. The MCDC building was one of the first on campus to receive a Sustainability Gold LEED certification (in 2010); Matty was a major part of this as he created and implemented a curriculum that incorporates sustainability through books, songs, discussions and practices/activities like picking up trash around the school/community and creating art projects with recycled materials. After advocating expansion of MCDC's hours to the afternoon for several years, this year Matty and his supervisor and co-teachers created a schedule and a curriculum for 12:00 - 4:30pm, following the 8:00am - 12:00pm morning session; not only has this been fun for some of the students (my daughter always wants to stay) and convenient for the parents, but it has also generated significant additional funds for the school. In addition to teaching at MCDC, Matty ran a music program at the adjacent Early Childhood Education Center (ECEC), playing music for and with all of the students and teachers weekly. 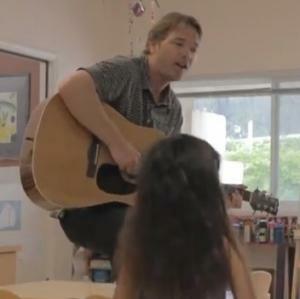 He recorded a CD of his original children's songs and made a copy for each classroom at ECEC. In collaboration with other teachers at ECEC, he created a Dr. Seuss presentation, including an original song, which is performed every year for the whole school on Dr. Seuss' Birthday. Matty worked with the Parent Advisory Board and, accompanied by another teacher at ECEC, provide the musical entertainment for the Ice Cream Social Picnic the last two summers, and will do so again this summer. Having attended it last year, I can attest that this is truly a community event — I ran into some of my UCSD colleagues whose children were too young to be at MCDC or ECEC, but who were there to see what these preschools are like. In the broader community, Matty teaches Sunday school at his church, volunteers to help with a Children's Theatre group in which his own three children perform, and participates in various homeless out reach programs. He is an excellent role model not only for the children at MCDC, and the student teachers who assist in the classroom, but also for the parents of the children he teaches — he responds thoughtfully, and from experience, when asked parenting questions. Only 2 - 3% of preschool teachers are men, and it is not a highly paid profession, but Matty's commitment to it, and his enthusiasm, joy and wisdom make him an incredible asset to the UCSD community.